Oh the incredible edible egg. How do I love thee? Let me count the ways. IV) did I mention there’s bacon? Cook bacon in a pan on medium heat until crisp. Drain on paper towel and set aside. Cut each hard boiled egg in half and carefully remove the yolks. In a mixing bowl, mash 6 full yolks with the avocado, garlic, olive oil, paprika, lemon juice and mustard. 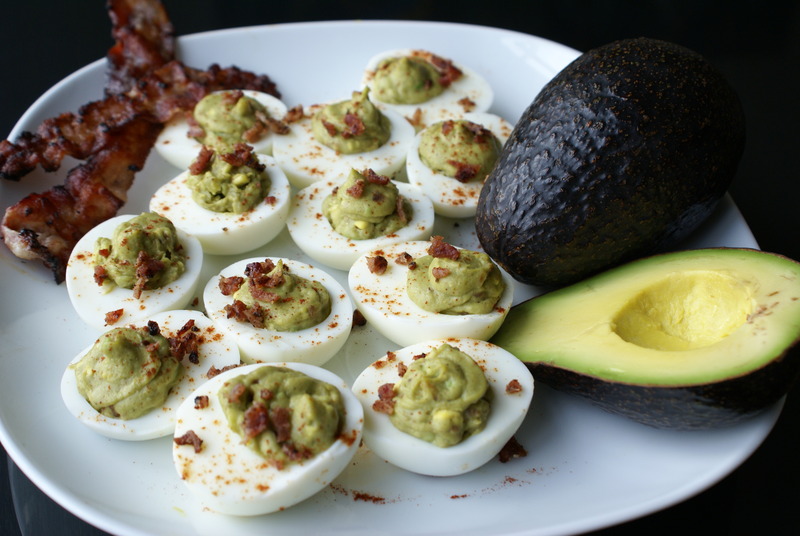 I don’t use all of the yolks because the avocado will make it rich enough. It should be a creamy consistency after you fully mix the ingredients. Take your cooled bacon and finely chop into small pieces and add to mixture. Stir together. Spoon each egg half with mixture. Sprinkle paprika on each egg and voila! You have your Bacon Devil Inside. This looks delicious! Looks like a variation of a Russian recipe. Thank you. Thanks Marina! I just love bacon and try to incorporate as often as possible. I fixed these to go with our dinner tonight, and they are all gone! The kids ate them like crazy. Great recipe. Thanks Melinda! It’s one of my favorite recipes!! It’s Super Bowl Sunday, going to make these to take to a party. How can I make them PURPLE? 😀 Just kidding, thanks!